Moultonborough is home to the "Castle in the Clouds", an estate set in the Ossipee Mountains. Thomas Gustave Plant made a fortune manufacturing shoes, bought 6,300 acres (25 km2) and hired the Boston architectural firm of J. Williams Beal & Sons to design "Lucknow," a stone mansion built between 1913 and 1914. The property, with sweeping views of Lake Winnipesaukee, is a popular tourist attraction. According to the United States Census Bureau, the town has a total area of 74.6 square miles (193 km2), of which 59.5 square miles (154 km2) is land and 15.1 square miles (39 km2) is water, comprising 20.29% of the town. A large portion of the town is located along Lake Winnipesaukee, the largest lake in New Hampshire. Moultonborough Bay, an 8-mile-long (13 km) arm of the lake, extends from the southern corner of the town towards the center of the town. Moultonborough Neck forms a peninsula between Moultonborough Bay and Center Harbor to the southwest. Long Island, the largest island in Lake Winnipesaukee, is connected to Moultonborough Neck by a bridge. The community of Suissevale, a census-designated place, occupies part of the northeast shore of Moultonborough Bay. 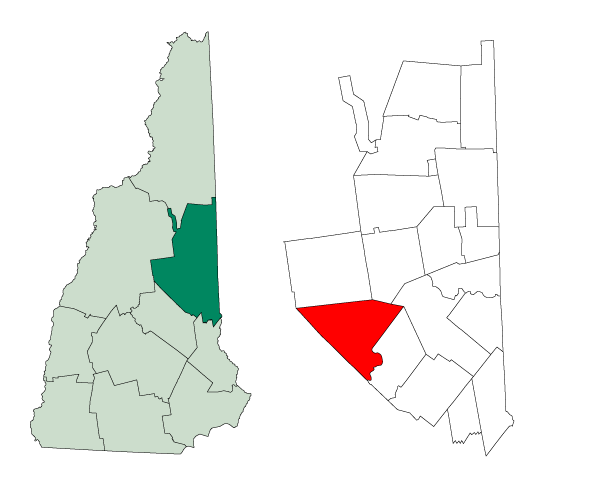 Inland from Winnipesaukee, Lake Kanasatka is in the west part of the town. Red Hill, elevation 2,029 feet (618 m) above sea level, is in the northwest. Mount Shaw, elevation 2,990 feet (911 m), part of the Ossipee Mountains and the highest point in Moultonborough, is in the east. The town center of Moultonborough is located 1 mile (1.6 km) north of the head of Moultonborough Bay, at the intersection of New Hampshire Route 25 and Route 109. Route 25 is a major east-west highway in the state connecting Meredith and Plymouth to the west with Ossipee, New Hampshire and Portland, Maine to the east. Route 109, a local road, proceeds southeast towards Wolfeboro and northwest to Center Sandwich. As of the census of 2000, there were 4,484 people, 1,884 households, and 1,377 families residing in the town. The population density was 74.9 people per square mile (28.9/km²). There were 4,523 housing units at an average density of 75.6 per square mile (29.2/km²). The racial makeup of the town was 98.48% White, 0.13% African American, 0.22% Native American, 0.56% Asian, 0.02% from other races, and 0.58% from two or more races. Hispanic or Latino of any race were 0.62% of the population. There were 1,884 households out of which 25.7% had children under the age of 18 living with them, 63.7% were married couples living together, 6.0% had a female householder with no husband present, and 26.9% were non-families. 23.7% of all households were made up of individuals and 9.8% had someone living alone who was 65 years of age or older. The average household size was 2.36 and the average family size was 2.77. In the town the population was spread out with 21.1% under the age of 18, 4.1% from 18 to 24, 22.3% from 25 to 44, 32.6% from 45 to 64, and 19.9% who were 65 years of age or older. The median age was 47 years. For every 100 females there were 97.6 males. For every 100 females age 18 and over, there were 96.6 males. The median income for a household in the town was $45,050, and the median income for a family was $51,729. Males had a median income of $34,236 versus $25,332 for females. The per capita income for the town was $25,733. About 3.2% of families and 4.0% of the population were below the poverty line, including 3.3% of those under age 18 and 2.6% of those age 65 or over. Moultonborough Academy is the local middle and high school, educating students in grades seven through twelve. The school is located off Blake Road just south of the village of Moultonborough. The Moultonborough Central School, which is located on NH Route 25 near the academy, serves grades K-6. The Central School has hosted an annual Veterans Day Assembly since 1998 to commemorate those who serve in the United States military. The Moultonborough School District serves only the town of Moultonborough. ^ "Geographic Identifiers: 2010 Demographic Profile Data (G001) - Moultonborough town, New Hampshire". U.S. Census Bureau American Factfinder. http://factfinder2.census.gov. Retrieved November 7, 2011. ^ "BEAN, Benning Moulton, (1782 - 1866)". Biographical Directory of the United States Congress. http://bioguide.congress.gov/scripts/biodisplay.pl?index=B000277. Retrieved January 21, 2014. ^ "General Jonathan Moulton". Lane Memorial Library. http://www.hampton.lib.nh.us/hampton/biog/moultontoc.htm. Retrieved January 19, 2014. ^ "Lucknow Estate History". Castle in the Clouds. http://www.castleintheclouds.org/history-preservation/lucknow-estate-history/. Retrieved January 19, 2014. ^ "The Claude Rains Grave Site in Moultonborough". Moultonborough Historical Society. http://www.moultonboroughhistory.org/MHS%20Articles%20&%20Tidbits/Articles/Claude%20Rains/Claude%20Rains.html. Retrieved January 19, 2014. ^ "Statewide County WI Archives Biographies.....True, John M.". USGenWeb. http://files.usgwarchives.net/wi/history/bluebook/1897/true1303gbs.txt. Retrieved 2015-08-27. Wikivoyage has a travel guide for Moultonboro. This page uses content from the English language Wikipedia. The original content was at Moultonborough, New Hampshire. The list of authors can be seen in the page history. As with this Familypedia wiki, the content of Wikipedia is available under the Creative Commons License.